An 8-year-old boy discovered the head of an Iron Age figurine while visiting the site of Beth Shemesh. A mosaic with an inscription from Isaiah 65 has been discovered near Adana, Turkey. Archaeologists have found a “giant fence” at Tell ed-Daba that dates to the time of the Hyksos’ invasion. Police arrested an antiquities dealer near Beth Shean with a collection of more than 3,000 illegally obtained coins. Google is adding Petra to its “Street View.” The queen of Jordan contributed by writing the company’s blog post. I’m impressed. Fadi Shawkat Haddad has released A Christian Pilgrimage Journey in Jordan. Haddad is a Christian tour guide in Jordan whom I worked with many years ago. The book covers 80 sites and costs $20 plus postage. The Summer 2015 issue of DigSight is now available in pdf format. This issue includes a report on the season at Lachish, the Ishbaal inscription from Khirbet Qeiyafa, and upcoming events. Charles E. Jones has expanded his bibliography of autobiographies of archaeologists and given it a new home. A team of researchers is learning more about how vellum was produced for pocket Bibles in the medieval period. Premier Exhibitions recently had a media preview of its King Tut exhibition. It features more than 1,000 precisely crafted replicas, arranged in the exact manner found by archaeologist Howard Carter in 1922. Qedem Reports is now accessible online through JSTOR. In the future, all Qedem volumes will be available. The Biblical Archaeology Society is running a Thanksgiving sale with discounts up to 85%. The future of archaeology is non-invasive and non-destructive technologies. This week on the Land and the Book: Bible Exploration Tech Tools with Scott Lindsey from Logos Bible Software. Here’s more on the new papyrus of the Gospel of John. BibleX has an interesting post on Paul and Bedbugs. Israeli archaeologist Yoram Tsafrir died on Monday. Wayne Stiles has a Black Friday special today for the release of his new audiobook, Going Places with God. I’ve highly recommended the book in the past, and I expect the audiobook to be popular as well. You can get the 40% off discount here. BiblePlaces.com has a huge 25% off sale going on this weekend. Discounts are pretty rare with these guys, so you should take a look. A papyrus with lines from the Gospel of John and dated to circa AD 300 was discovered on eBay. Excavations at Khirbet el-Eika suggest a pagan population lived at this Hellenistic site near the Horns of Hattin. A new exhibit with finds from Gath (Tell es-Safi) is on display at the University of Kansas. Eisenbrauns is offering all four volumes of Royal Inscriptions of the Neo-Assyrian Period (RINAP) at a discount of 40% off retail price until Nov 27. The second volume on excavations at Yavneh covers 7,000 cultic items from the 9th-8th centuries BC discovered in a repository. Carta has released a 2nd updated and expanded edition of The Raging Torrent, by Michael Cogan. The New Yorker: Can digital technology make the Herculaneum scrolls legible after two thousand years? Hurriyet Daily News profiles Gaza resident Nafez Abed, a specialist in preservation and reproductions. Colorized photos of the discovery of King Tut’s tomb are now on exhibit in New York City. The Chicago Hittite Dictionary Project now has a website. You can have your tweet preserved on a cuneiform tablet. The Mountain to Valley Relay is a 215 km relay race in northern Israel. Registration opens in January. A beautiful mosaic from the Roman and Byzantine periods excavated in Lod went on display this week. A hoard of 3rd century Roman coins has been found in Switzerland. You can now visit every gallery in the British Museum with Google Street View. Reuters revisits Rujm el-Hiri in the Golan Heights. Wayne Stiles observes the irony that a “seat of Moses” was discovered at Chorazin. An ornately decorated 1st century A.D. basilica once used by a pagan cult is now open to tourists in Rome. Now on pre-pub pricing for Logos: AR151 Archaeology in Action: Jesus and Archaeology, with Craig Evans. The Ancient Semitic Languages Youtube Channel has a reading of the Mesha Stele in Moabite. Urban Legends of the New Testament is on sale for $4.99 for Kindle. Ferrell Jenkins has announced his 50th Anniversary Tour to Israel. I’ve never heard of a modern-day “tour of Palestine,” but Felicity Cobbing reports on her annual tour to sites in the West Bank. Leen Ritmeyer responds to the recent Popular Archaeology claim that the Jewish people are praying at the wrong wall. I am excited to announce that Seeking a Homeland is planning a study tour of Israel for this upcoming summer! See here for details/registration and below for a discussion of the uniqueness of the planned tour. Add-on: Tel Burna Archaeological Project June 19-July 15, 2016 (1-4 weeks); a $150 discount will be applied to a participant who joins the project (minimum one week). This study tour is not for everyone. During this tour, there will be very little time for relaxation and even less time for shopping, but we will find time to swim in the Mediterranean, Sea of Galilee and Dead Sea. This tour is built on the IBEX (The Master's College) model - where I have taught/led study tours since 2010. This type of study tour will be much different than your standard "church" or religious tour of Israel that often devote equal amounts of time to the hotel's swimming pool as they do at biblical sites. While intensive study tours are much less common than the typical tour described above, there are other good options. So what makes Seeking a Homeland's tour unique? First, this tour will be led by an experienced teacher who also is a trained and active biblical archaeologist (in the field, classroom, and the academy). Second, participants will have the opportunity to excavate at Tel Burna (Libnah), a major archaeological site, immediately following the tour. In my opinion, an archaeological excavation is the natural "follow-up experience" to an intensive geographical study of Israel. This is born out by the fact that many people who visit Israel develop an interest in biblical archaeology and attempt to follow current discourse through such means as Biblical Archaeological Review and this blog. On the other hand, there are some who have only taken part in an archaeological excavation in Israel and have not had the opportunity to travel throughout Israel and, subsequently, gain a working knowledge of the country's geography and history. Planning the field tour in connection with the archaeological project allows for participants to experience both the broad scope of biblical geography while also participating and helping recover the "nuts and bolts" (or "weapons and pottery") of individuals who actually lived during the time of the Bible. This combination makes Seeking a Homeland's tour unique and a good opportunity for those who have never been to Israel or returnees who would like to refresh their past geographical knowledge and gain new insight by participating in an important archaeological investigation of a biblical site. 1) to observe as much of the country as possible. 2) to illustrate and contextualize the Old and New Testament narratives against the backdrop of Israel's geography, archaeology and history. 3) to internalize the landscape, background, and worldview of the biblical authors and audiences, in order to achieve better and more nuanced interpretations and, thereby, applications of the biblical text. For those who decide to join the Tel Burna Archaeological project following the tour, an additional goal will be for participants to "experience the physical culture (cooking/eating, religious, military, administration, etc.) of the Canaanite and Israelite world" through a first-hand experience of archaeological excavation. Imagine yourself finding a Canaanite figurine depicting Asherah (Judges 2:13) or a LMLK seal impression from the time of King Hezekiah (2 Kings 19:8) - both from the town of Libnah, which the Bible says was defeated by Joshua (Joshua 10:31-32) and Sennacherib (2 Kings 19:8). These are the types of finds that are waiting for us at ancient Libnah. Pottery is the most abundant find in any archaeological excavation. Because everyone used pottery in antiquity, because pottery is so fragile and required frequent replacement, and because pottery is impervious to deterioration from environmental conditions, pottery can be found at every ancient site. At each dig, potsherds are collected, cleaned and examined. Pottery can tell us about a site's occupation history, it helps us to date the associated strata and structures, and it can reveal such things as relations (trade or otherwise) between sites and regions. For decades, the standard reference work has been Ruth Amiran's Ancient Pottery of the Holy Land from Its Beginnings in the Neolithic Period to the End of the Iron Age (New Brunswick: Rutgers University Press, 1970). This volume is quite useful, although, after nearly 50 years, a refresh is needed. Rumors have circulated for some time that an update, to be edited by Seymour Gitin, was being prepared, but the apparent delay led some to wonder secretly whether there was any truth to the rumors. Yesterday, they were proven true. These two volumes offer a comprehensive corpus of ceramic forms and their typological development organized according to period, geographical region, and cultural tradition. The focus of each chapter is on the most characteristic pottery types and decorative motifs selected from a wide range of sites. Unique in scope, this publication presents a wide range of ceramic types accompanied by specially prepared pottery plates and color photos illustrating thousands of forms. A classic reference work, it serves as an essential resource for archaeologists and other scholars and students of ancient Near Eastern studies. Volumes covering the Neolithic and Chalcolithic periods and the Bronze Age are currently in preparation. 808 pp., 328 plates with 3,393 images; 34 color photos illustrating 277 vessels; hard cover 27.6 x 21cm. 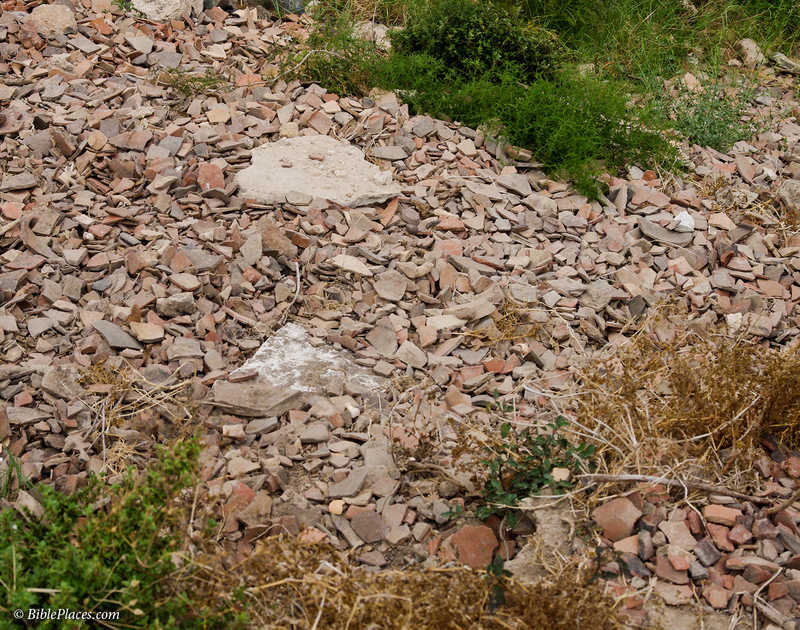 Discarded pottery sherds at Tell Arqa, Lebanon. You don’t have to watch too much of this video footage of a flash flood at the tabernacle model in Timna Park to be impressed. Repairs to the outer court posts are underway. A leaky pipe at the Western Wall was mistaken for the Messiah. There’s more talk about rebuilding the Colossus of Rhodes. Archaeologists have discovered an unknown temple of Hatshepsut. Now online in pdf format: The Archaeology of the Cuneiform Inscriptions, by A. H. Sayce. Here are lots and lots of historic photos of Nazareth. Independent Traveler suggests the 10 Best Israel Experiences. I suspect that many of our readers would be interested in The First Days of Jesus, by Andreas J. Kostenberger and Alexander E. Stewart. There are a couple of archaeology lectures this month in the DC area. Just released: Galilee in the Late Second Temple and Mishnaic Periods, Volume 2: The Archaeological Record from Cities, Towns, and Villages, edited by David A. Fiensy and James Riley Strange. The table of contents, introduction, interviews with the contributors, and a sample chapter are online. Individual chapters focus on Nazareth, Magdala, Bethsaida, Tiberias, Kedesh, Khirbet Qana, and much more. This will quickly become the classic archaeological guide to Galilee. There will be no roundup next weekend. A study of the temperature of the walls of Tut’s tomb is promising for those looking for a hidden chamber. Ben Carson believes the pyramids of Egypt were built by Joseph to store grain. Joseph’s tomb has been restored. The Hebron archaeological site will not be leased to Jewish settlers. The PEF has posted a brief video compilation of their recent conference on Jericho. G. M. Grena reports on a new book dedicated to Robert Deutsch (that includes a chapter by Gabriel Barkay), his visit to Passages exhibit and lecture, a forthcoming game, and a secret link. If you don’t know about the Lanier Theological Library, you should read this. This is your last chance to get in on Logos’s Classic Studies and Atlases on Biblical Geography (7 vols.) at the best pricing ($24-30). Now free in pdf format: The Petrie Museum of Egyptian Archaeology: Characters and Collections, by Alice Stevenson. Our most popular photo this week on Facebook and Twitter was this Psalm 23 image from the American Colony Collection. Is This Really the Akra? Has the Akra been discovered? On Monday the Israel Antiquities Authority (IAA) circulated a press invitation to “A Solution to One of the Greatest Questions in the History of Jerusalem.” The location of the Hasmonean fortress of the Akra has long eluded archaeologists, but recent work in the Givati parking lot in the Central Valley below Dung Gate has uncovered a massive structure from this period. Is this alone sufficient to identify this structure as the Akra? I think there’s an automatic suspicion because of the tendency of archaeologists to want to find something great, something that will get their name in the press, lead to invitations to speak, and bring in financial support. I think the burden of proof necessarily increases for any discovery that claims to solve a long-standing question. 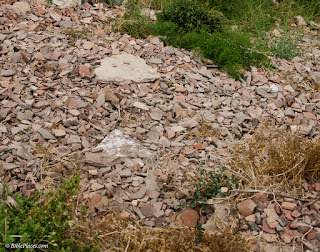 One might recall as well that it was in this very spot that this very same archaeologist claimed to have found the palace of Queen Helene of Adiabene. It’s not impossible that a palace was built on top of the remains of a fortress, but significant evidence is necessary to convince skeptics like me that the archaeologist isn’t simply tagging every big wall he finds with the most impressive label from the time period. Is there another way to explain the arrowheads and ballista stones? It would seem that any fortification structure would be the target of attack. As far as the period goes, the Akra was standing in the 2nd century BC, but so were other fortifications. The Hasmoneans fought with the Seleucids for more than twenty years, but finding evidence of such warfare doesn’t mean that the excavated structure must be the famous Akra. There is yet another problem. Historical sources tell us that the Akra was built to protect the Temple Mount. The excavated building, however, is 120 meters south of Herod’s Temple Mount and down the slope at that. If they found the Akra, it is in the wrong place. Leen Ritmeyer explains this point in detail. The archaeologists have found important remains that will fill in significant details in Jerusalem’s history. For that they are to be commended. But they must know that they will not be able to get away in making sensational claims that are not supported by the evidence. You can read more about this discovery in the IAA press release as well as stories by the Times of Israel and the Jerusalem Post. Arutz-7 has a 2.5-minute interview with the archaeologist, Doron Ben-Ami. A scholarly published article in Hebrew is available at academia.edu. High-resolution photos and a video are temporarily available here. The precise location of the Jewish temple is debated by scholars. Some believe that the holy of holies was located over the “rock” (es-Sakhra) under the Dome of the Rock. Others believe that the altar sat on this rock. A few have held that the holy of holies was situated about 100 yards to the north under the “Dome of the Tablets.” But no scholars doubt that the temple stood somewhere on the Temple Mount. Robert Cornuke has a history of making sensational discoveries in the field of biblical archaeology. He has located Mount Sinai, the Ark of the Covenant, Paul’s shipwreck, and he thinks he knows where Noah’s Ark is. In his latest effort to produce a bestseller, Cornuke argues that the temple was not on the Temple Mount but was located to the south in the City of David. This proposal is absurd to anyone who is familiar with the geography and archaeology of Jerusalem. Scholars don’t even waste their time on such theories. But sincere laypeople who lack a background in the subject are too easily misled by a selective presentation articulated by a charismatic former police investigator. Gordon Franz has written a helpful explanation of Cornuke’s theory and its many weaknesses. He begins with an 8-point summary and links to his 46-page essay. I recommend it. If you would rather just read the straight story on the Temple Mount, written by the world’s experts on the subject, grab Leen and Kathleen Ritmeyer’s new guide, Jerusalem: The Temple Mount. An undisturbed 3,500-year-old soldier's tomb with enormous treasures has been found in southwest Greece. A secret tunnel built by the Hittites has been discovered in central Turkey. Twenty two ancient shipwrecks have been discovered off the coast of Turkey. A fine first-century marble head of the mythical greek hero Hercules has been acquired by the Dallas Museum of Art. Charles Jones has posted a preliminary bibliography of autobiographies of scholars of the greater Ancient Near East. The Cuneiform Digital Library Initiative has added to its library works from the Detroit Institutes of Arts. "Scan Pyramids" is a new study by Egyptian and foreign experts that will use modern infra-red technology to map four pyramids and search for hidden secrets. David Moster identifies 10 great biblical artifacts in the Bible Lands Museum Jerusalem. The Jordan Times reports on restoration efforts at Macherus. The Hungarian team plans to excavate until 2029 and to create a visitor’s center in a Herodian cistern.